This is one of our favourite dishes from our most used cook book – 5 of the Best, by Valli Little. 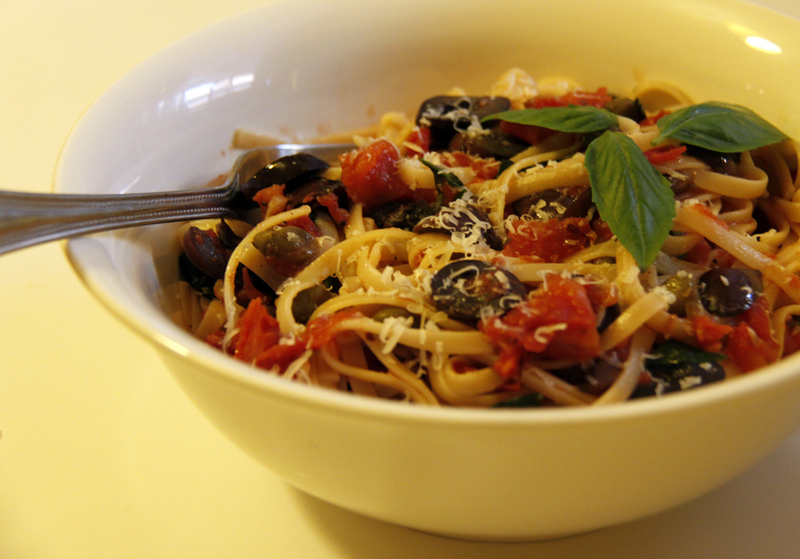 We both love our pasta and have it at least once a week, and this dish is made up of some of our favourite ingredients; kalamata olives, basil, garlic and sundried tomatoes, which are all given a lift with a hint of heat from the chilli. As far as pasta dishes go, this one is as easy as they come, but has so much flavour – try it! This entry was posted in Dinner, Uncategorized and tagged Basil, Dinner, Food, Italian, Pasta, Puttanesca, Spaghetti. Bookmark the permalink.